KBS undergraduate summer researcher, Maiya Wimbley, is a student in the Eli Broad College of Business at Michigan State University. 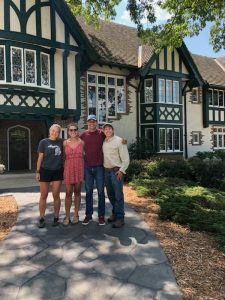 She wrote about her Undergraduate Research Apprentice (URA) project working with mentor and KBS scientist, Kate Glanville, in the Robertson lab. The team working with Kate that summer, including Maiya. Posted on the door leading to the Robertson Lab was a sign that read “Research Area: Do Not Enter.” Upon reading the sign, I promptly turned around, certain I wasn’t allowed back there—they were doing real science, I was just visiting. I wandered around for a few more minutes before asking for help and was ushered through the very doors that had stopped me before. The feeling that I wasn’t meant to be at the W. K. Kellogg Biological Station (KBS) came and went throughout the summer, which I now realize is common. My role as an Undergraduate Research Apprentice (URA) tasked me with the responsibility of helping my mentor, Kate Glanville, with her research projects. In her role as my mentor, Kate helped me to learn new skills and grow as a scientist. Each morning I was presented with a different task that challenged me and taught me the value of being precise and efficient, both in the field and in the lab. Kate’s research focuses on the impacts of climate change on nitrogen cycling. As an avid nature lover, anything related to climate change is of great interest to me. Within the first few weeks, Kate encouraged me to find an element of her research that I was particularly interested in and create my own mini research project. I chose to investigate the interactions between soil pH and biological nitrogen fixation in legumes. My average day was spent driving around the Long-Term Ecological Research (LTER) plots maintaining the eight rain shelters, transporting water from the pond to our water tanks, and ensuring that we were prepared on rain application days. Most days I left the LTER muddy, sweaty, and exhausted, yet I loved days in the field. Hot summer days spent running from the field lab, to the shop, to the field, and then back to the field lab again because I probably forgot something, were balanced by days spent at the pond. Spending a clear warm morning, or even a dreadfully hot afternoon, pumping water from the pond into 50-gallon barrels in the bed of the truck filled me with a sense of contentment. I could read, listen to a podcast, or simply absorb the scenery around me while I waited. The work could be repetitive, but it was better than any job I’d ever had before. For me, the most important memories from the summer stem from the days I was tasked with something unexpected– the time I helped build rain shelters and learned to use power tools for the first time, or the time I worked to disassemble a broken water pump and then put it back together to find that it miraculously worked again. These moments are important for me to remember because they remind me of my ability to adapt and learn from situations and encourage me to approach unknowns confidently in the future. KBS is a unique place, not only because of the abundant opportunities and resources available, but also for its sense of community. I saw the same faces every day, forged close friendships, and experienced the ebb and flow of living in a small community. Living within such a diverse group of scientists exposed me to new topics and ideas that I hadn’t embraced before, which helped me grow as both a scientist and a person. I learned countless things this summer, the first and most important being that I probably won’t pursue a career in research. As much as I loved my time spent at KBS, I found myself more enthusiastic about being outdoors than about data and results. Despite that realization, I learned valuable skills that can be applied in any career path, namely resourcefulness and confidence. When I reflect on my summer and compare the way I felt on day one, fearful of making mistakes and worried I was in the wrong place, and the way I feel in my final week, I can feel the immense amount of growth and knowledge I gained, which I’ll never forget.